In 1947 a stranger came to pray at The Heights Jewish Center. He was the tenth man, needed to complete the minyan. 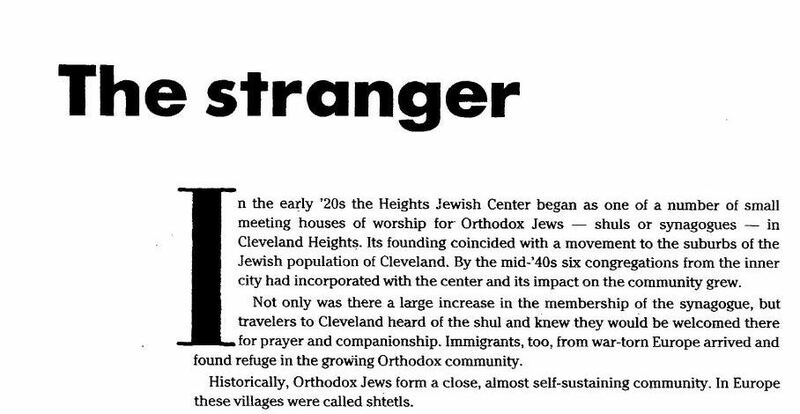 On March 5, 1987 the Cleveland Plain Dealer Sunday Magazine had a story by Shony Long about Rabbi Israel Porath and the stranger. For a printer-friendly version of this page, click here. Shony (Shoshanna) Long was the daughter of Rabbi Isaac Krislov who served the Shaker - Lee Synagogue (Orthodox) for many years. Her upbringing in an Orthodox Jewish home accounts for her detailed and warm description of the setting of the story. Shoney Long passed away in April 2015, age 84. Her last residence was Stone Gardens. This is a difficult story to confirm, for the participants are long gone. Rabbi Porath died in 1974, Jan Peerce in 1984. A man only 35 at that service would be 100 today (2013). The oldest members of the congregation know that Jan Peerce attended services when in Cleveland, but do not remember this incident. Web searches for the author Shony Long told us only that she had been a librarian in the Cleveland Heights - University Heights system. I asked Laurie Marotta, a CH-UH Library executive, if there was a way Shony Long could be contacted. Ms. Marotta passed along my request to retired librarian Maureen Weisblatt, who often visited Shony Long. Days later I received word that Shony Long remembered writing the story. When I called Maureen Weisblatt she passed along Shony (Shoshana) Long's explanation of how she heard it. It was in a meeting of a group called Coventry Neighbors that met at the Coventry Road library, near Euclid Heights Blvd. A man who had been in that prayer group back in the 1940's told the story. A free-lance writer who had published several stories in the Plain Dealer, she asked the man if she could tell that story and he gave her his permission. 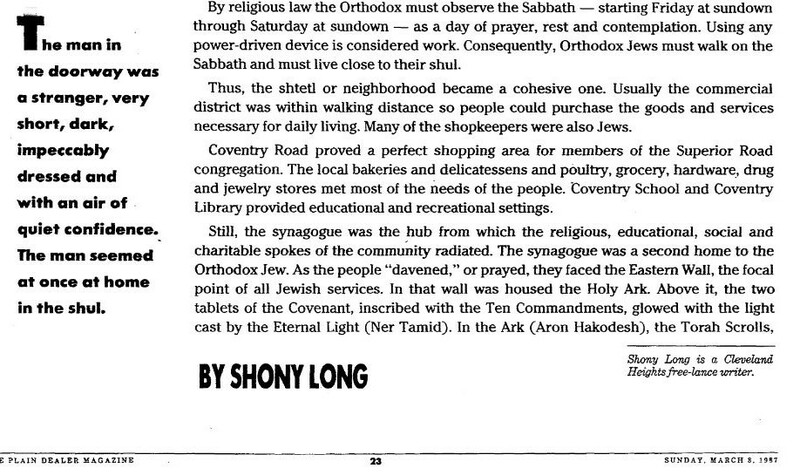 I have since learned that Shony Long was the daughter of Rabbi Isaac Krislov who served Orthodox synagogues in the Shaker-Lee area for nearly 35 years and can understand why she would have found this tale so appealing. 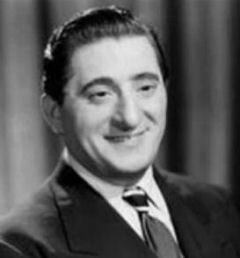 Jan Peerce was born Joshua Pincus Perelmuth on New York's lower east side in 1904, his parents immigrants from Belarus. Known as Arturo Toscanini's favorite tenor, he was a leading tenor of the Metropolitan Opera from 1941- 1966. When in Cleveland he was a regular visitor to The Heights Jewish Center. We must then assume that this story is about his first visit when Israel Porath was the rabbi, for on later visits Rabbi Porath would surely have known who he was. Jan Peerce sings "A Plea to God"
Israel Porath became rabbi of The Heights Jewish Center in May 1946. A search of the Plain Dealer archives shows Jan Peerce's first winter visit here (remember the severe snowstorm that reduced the attendance) after May 1946 was a concert with the Cleveland Women's Orchestra on the afternoon of Sunday February 23, 1947. No, that's not January, as told in the story, but with 40 years since the event (1947) and its written expression (1987), that's close enough for us. The story described a blizzard and a foot of snow. Let's look at the Cleveland Plain Dealer for Saturday February 22, 1947. Enough said. We regard this sweet story as true.